In a sport like college football, with an increasing disparity between haves and have-nots, there can be great power in zigging when everyone else is zagging. Without the zig, this sport wouldn’t be what it is today. The air raid, the option, thousands of tiny innovations in between: all zigs. A lot of times, though, you find out why no one else was zigging. Bowling Green’s method for finding head coach Mike Jinks, for instance, was certainly creative. Then-AD Chris Kingston wanted to keep a good thing going. So he Googled which team had the best offense that year, noted it was Texas Tech, and essentially targeted the top Red Raiders assistant he could afford. “Bring me someone from Texas Tech I can afford!” was a bad zig. Since winning 28 games and two MAC titles from 2013-15 under Dave Clawson (now at Wake Forest) and Dino Babers (Syracuse), the Falcons have won nine. They fell from 10-4 and 51st in S&P+ to 4-8 and 93rd in his first year, then 2-10 and 101st in his second. They were 1-6 last year when he was mercifully fired, and they rebounded to finish 126th (out of 130) in his absence. By comparison, athletic director Bob Moosbrugger’s approach to hiring Jinks’ replacement was downright normal. Sure, he didn’t go the “up-and-comer” route that brought Matt Campbell and Jason Candle to Toledo, and he didn’t go with the proven small-school coach, a la Lance Leipold to Buffalo (from UW-Whitewater), Chris Creighton to EMU (from Drake), or Clawson and Babers to BGSU. And he didn’t go with a guy with any sort of spectacular track record. But at the very least, maybe Scot Loeffler had thought for a moment or two about becoming a head coach before he became a head coach. Progress! The 44-year-old first made waves as Michigan’s quarterbacks coach and will forever have Tom Brady’s name on his résumé because of it. He spent a year coaching Tim Tebow at Florida, too. Since 2012, though, he’s mostly been synonymous with failed reclamations. He was asked to save Gene Chizik’s Auburn offense in 2012 but couldn’t (61st in Off. S&P+), then moved on to three years of scuffling for Frank Beamer at Virginia Tech (average rank: 73.3). He spent the last three seasons at Boston College, where — despite a burst at the end of 2017 — his offenses never topped 88th. The 2015 Virginia Tech attack, ranked 57th in Off. S&P+, is the best offense he has coordinated. Loeffler has really leaned into the Island of Misfit Coaches vibe. He elected to retain well-worn defensive coordinator Carl Pelini, though it appears Pelini is heading to Youngstown State to coach with his brother. That could be great news for Brian VanGorder, the Loeffler of defensive coaches (who actually coached at Auburn with Loeffler in 2012, with similar not-quite-success), hired as linebackers coach. Offensive coordinator Terry Malone is a 35-year veteran who coordinated Purdue’s 2015 and 2016 offenses (82nd and 92nd in Off. 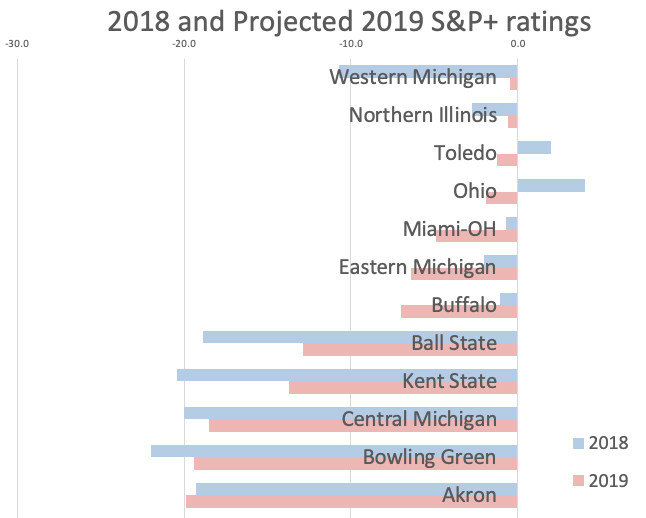 S&P+, respectively), after a long stint with Loeffler at Michigan. To put it diplomatically, you’d love to see a bit more success on these long résumés. In a MAC built around speedier player types, it’s not impossible to build around a meaty run game. But that’s quite an identity shift. 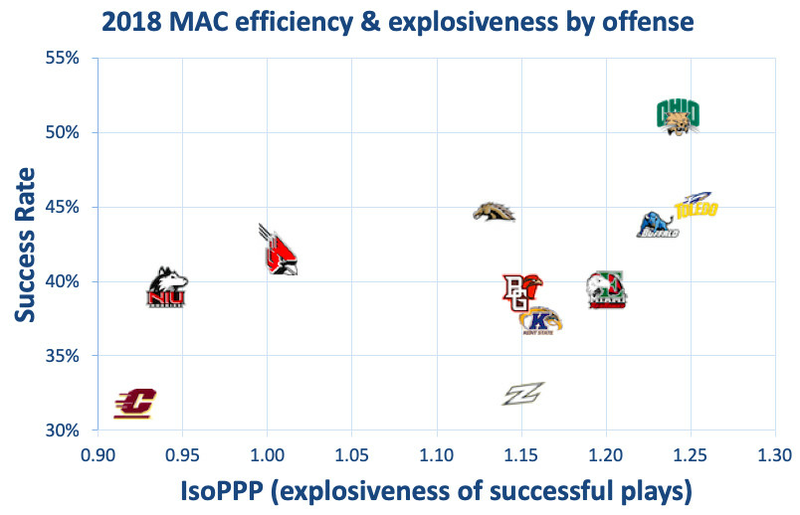 Despite Jinks’ pass-heavy preferences (BGSU was 93rd in standard downs run rate and 89th in passing downs run rate), Malone’s offense could look like a Malone offense sooner than later. The leading returning rushers are 200 (Andrew Clair) and 217 pounds (Rico Frye), respectively, and the five most experienced linemen (Jack Kramer, Lorenzo Taborn, Caleb Bright, Matt Tanner, and Derek Downs have combined for 62 career starts) average 6’5, 313. Taborn and Tanner are listed at 325 pounds or heaver. Size doesn’t equal skill, but you need both, right? Halfway there! Clair and Kramer were bright spots for this offense last year. Clair had 24 carries for 194 yards in late wins over Akron and CMU, and he and since-departed receiver Scott Miller were BGSU’s only hopes for big plays — he had seven carries of 20 yards or more. Kramer, meanwhile, earned third-team all-conference honors at center. Quarterback Jarret Doege had bright moments as well. (The offense wasn’t great, but certainly wasn’t Jinks’ biggest problem.) BGSU was 71st in passing success rate, and he ended up with 2,660 yards and 27 touchdowns. 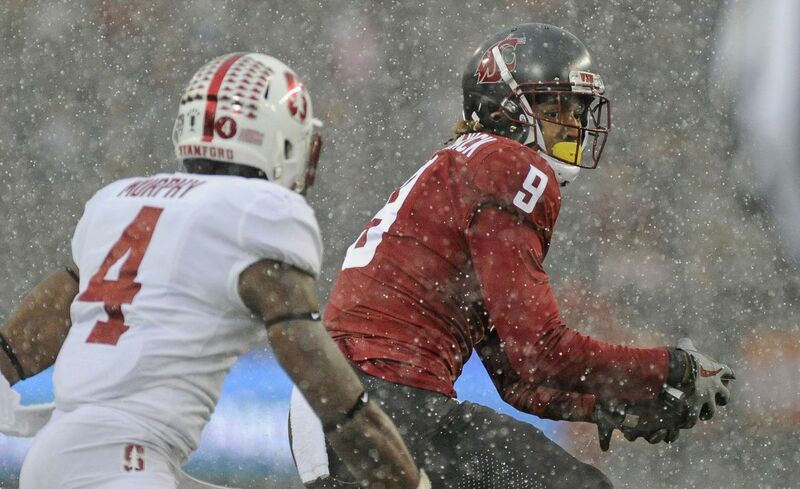 Miller was Doege’s go-to receiver, but the former Texas Tech quarterback will have 6’4 junior Quintin Morris (41 catches, 516 yards, 7 scores), Washington State transfer Isaiah Johnson-Mack (60 for 555 in 2017 in Pullman), and seniors RB Marlow III and Jordan Wayne-Prather (combined: 46 catches, 487 yards). Tight end wasn’t of frequent use last year — that might change — and could get replenished with the addition of Indiana transfer Austin Dorris and some redshirt freshmen. Still, one figures there will be quite a bit more focus on rushing and physicality, and while the pass blocking was further advanced than the run blocking last year (the Falcons were 120th in stuff rate allowed), girth alone suggests they could lean on some smaller opponents. 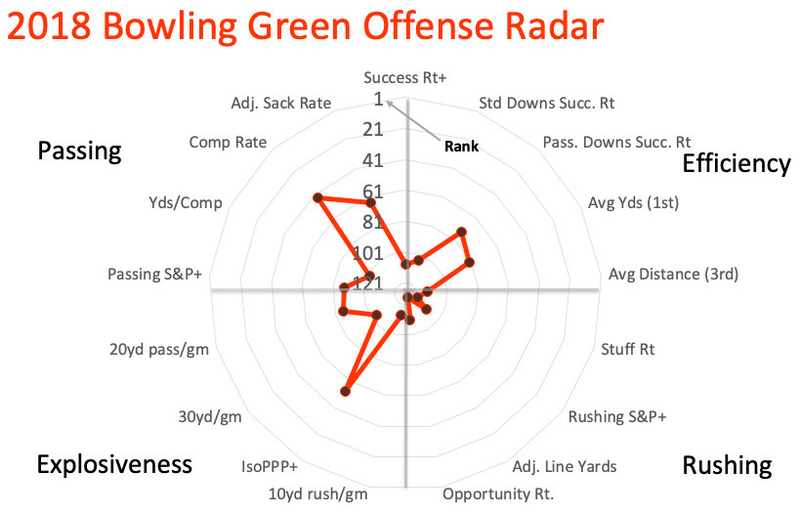 I try to apply some positive spin in these previews, and I tried my best to paint Bowling Green’s 2018 defense as one with potential for improvement, premised around Pelini’s presence and the experience on the two-deep. Four of last year’s top five linemen return, but seven recent three-star recruits — sophomore tackle Josh Croslen, plus four redshirt freshmen and two true freshmen — wait in the wings. Linebackers Brandon Harris and Posey are back but could get pushes from Coleman, redshirt freshman Jerry Roberts, two JUCOs (Hassan Belton and Brandon Perce), and three three-star true freshmen. Roberts and Perce didn’t play, and Belton showed promise before being lost with injury in the second game. Harris and Coleman played nearly every down. Each of last year’s top eight DBs is scheduled to return, plus a 2016 starter, but three recent three-stars could push for time there, too. Leading returning safety Fred Garth missed three games, and the 2016 starter, safety Jamari Bozeman, missed four. Leading returning cornerback Cameron Jefferies ended up making four TFLs and 12 passes defensed … for Cincinnati. 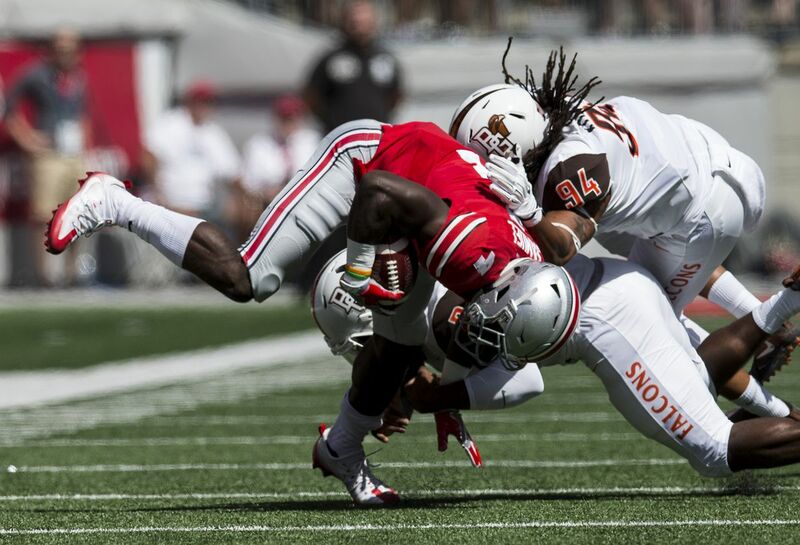 The youth is most intriguing in the front seven, where BGSU needs the help the most. 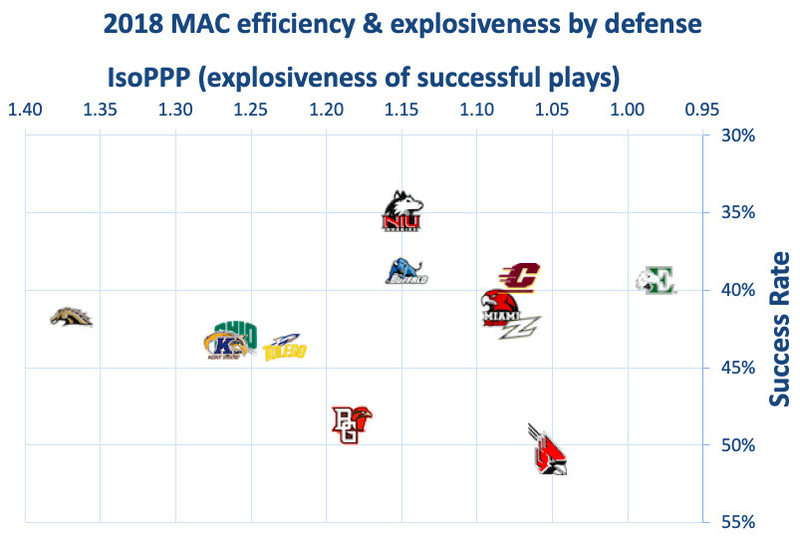 Opponents gained at least five yards on 46.6 percent of their carries in 2017, the third-most in the country, and BGSU made few disruptive plays to counter that. Despite the iffy depth that Konowalski’s and Sanders’ absences caused, none of those redshirt freshmen made an impact. True freshman Karl Brooks led the team in sacks (albeit with just 3.5) but, at 235 pounds, got pushed around a bit too much to make an impact in run defense. 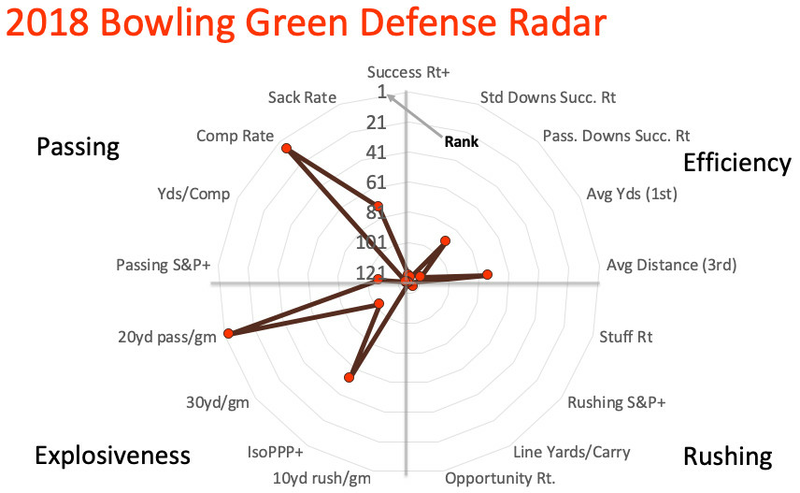 Long story short: Bowling Green’s defense was terrible. The Falcons fell from 119th to 128th in Def. S&P+, getting shoved around against the run and playing all-or-nothing pass defense — eighth in completion rate allowed, 129th in passing marginal explosiveness. Whether VanGorder or someone else mans the defense, he’ll take over a unit with the opposite experience ratio as last year — he should have plenty in the front seven and little in the back. If Konowalski returns 100 percent, the Falcons could have a nice, quick front seven with the senior teaming with ends Brooks and Roland Walder (combined: 8.5 TFLs, 5.5 sacks) and tackles Kyle Junior and DeMontae Haigler (10 TFLs, five sacks). At linebacker, Harris gone, but Coleman’s decent, and between Belton and untested youngsters, there might be decent speed. The secondary is now the concern, though. The three players responsible for most of the defense’s disruption — corners Clint Stephens and Montre Gregory and nickel Marcus Milton — are gone, leaving safeties Jerry McBride III, Bozeman, and Caleb Biggers, and … I have no idea at cornerback. Junior Ty Redding is the leading returnee; he had three tackles last year (with two breakups!). Marcus Milton was a pretty efficient punt returner. I just listed all of BGSU’s 2018 special teams strengths. The Falcons were 89th in punt efficiency, 116th in FG efficiency, 121st in kickoff efficiency, and 130th — dead last — in kick return efficiency. Loeffler retained linebackers coach Jacob Schoonover and moved him to special teams coordinator. I’m not sure that was a kind thing to do. I swear I don’t mean this to sound as mean as it probably does, but if there’s one benefit here, it’s that Loeffler understands what it’s like to bide your time without visible improvement. And while the offense is pretty experienced, the identity shift on that side of the ball, combined with a defense that is starting from scratch (and maybe led by VanGorder), seems like a recipe for extremely low expectations in 2019. The good news is that if there’s some improvement, that puts a few wins on the table. There are two winnable non-conference games — home games against FCS Morgan State and Louisiana Tech (94th in S&P+ in 2018) — and MAC East foes CMU and Akron, both starting over with new coaches themselves, come to Bowling Green. If the Falcons can match or slightly exceed last year’s 3-9 record and establish a run game with Clair, Frye, and a big OL, then that’s probably enough for 2019.